It's hard to stick out in the slew of books that take place in 16th century England isn't it? Thankfully authors have recently been straying away from the usual suspects (Henry VIII, his wives, Elizabeth I, etc) and focusing on less talked about but equally as key characters. Sandra Byrd excels at this, as seen in her past novels, and has done it again in Roses Have Thorns. This novel focuses on Elin von Snakenborg, one of the closest friends of Elizabeth I. Elin leaves her homeland of Sweden unloved by her fiance and scorned by her sister for England, where through marriage she becomes the highest ranking woman besides the queen. When her first husband dies, Elin (anglicized as Helena) is torn between a personal life and being loyal to Elizabeth. The queen forbids her marriage to a man of low rank, so they marry in secret. Helena and her new husband had at least eight children who they kept away in the country and naturally, as a mother, Helena wants to be with them but is often called away by Elizabeth. When her husband's family is later involved in Catholic plots (remember, Catholicism is a BIG no-no during this time), she once again doesn't know what side to take - her family's or the queen's. I thought Helena was a fascinating character. Since this book doesn't cover her entire life, I looked her up on wikipedia and found out she lived until 86, dying in 1635. The page also claims that on her death, she had 92 living decedents When you read the book and see how quickly her family in England grows you can definitely believe that! She seemed like a fascinating woman who started her life as the relatively unimportant youngest daughter of a Swedish family and ended as a Marchioness and the closest friend of the queen of England. Sandra Byrd is a great story teller and makes every character come to life. The relationships are real and there's a wonderful blend of politics, history, and personal stories. This is historical fiction at its best! 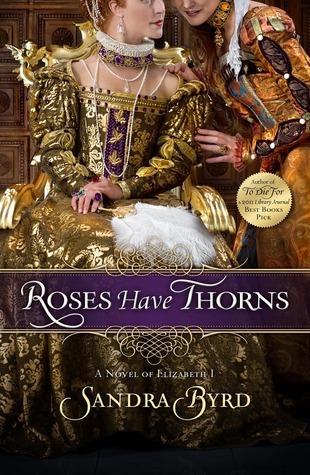 I have a copy to Roses Have Thorns to give away to one of you! To enter, simply leave a comment below with a way to contact you. This giveaway is open only to the US unfortunately, and you have until May 5th to enter! I am hoping to read this book soon. Thank you for the giveaway! Thank you so much for the wonderful review, Kelly. It made my day! I love historical fiction written like a fascinating story. Would like to read another book set in this time period, haven't for a while. She sounds like a fascinating woman to read about. I think the friends/people surrounding Elizabeth I are so fascinating! Looking forward to reading this one. Thanks for the giveaway! How have I not heard of this book before now?? I would love to win this book. I am a fan of historical fiction books as well as Sandra's. Thank you for the giveaway. This sounds awesome! I can't even imagine living to see 92 descendants. Talk about leaving your mark! This sounds like a great book. Historical fiction is my favoite genre. Thanks for the giveaway! I would love to read another by Sandra Byrd. This one sounds like another winner! This is definitely a book I must read! Thanks for the giveaway.